What do you do when you love a blockchain project and also want to preserve the environment? This question has crossed the minds of many crypto enthusiasts who are also aware of the increasing global warming effect brought about by increased carbon emissions from power generating plants (coal and diesel plants). More so, when you consider that Bitcoin mining activities have on many occasions been highlighted as a contributor of Carbon Dioxide in the atmosphere due to the amount of electrical energy used to mine BTC. The more you mine BTC, the more power is generated from the plant. This means more coal used and more carbon emissions. In a sense, Bitcoin has become a scapegoat for energy analysts and naysayers of blockchain technology. However, we had explored a few days ago how some of these studies and reports are one sided. The XRP community believes that the digital asset should be the standard for it takes less energy to process a transaction on its ledger. Transactions on the XRP ledger consume less than the standard VISA transactions. A while back, Ethereum World News had highlighted this fact that can be summarized by the following info-graphic. 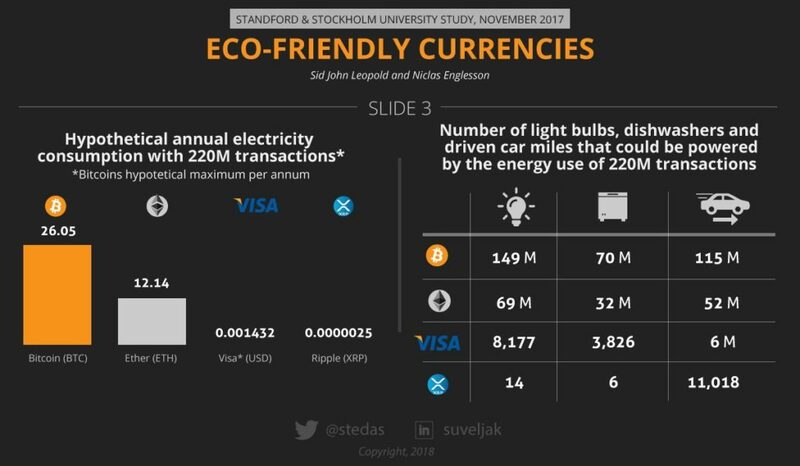 But what if you want to do more than just accept XRP is the most eco-friendly? What if you want to reduce its carbon footprint by planting trees to negate the environmental impact of transactions on its ledger? Well, the XRP community has done just that through the #XRPTree project that is spearheaded by twitter user @WanderingWare. The project has partnered with the One Tree Planted Organization. The latter organization has an ingenious system where $1 donated, equals one tree. #XRPtree project is official partnered with OneTreePlanted.org who have an ingenious system where 1USD$ = one tree. They do this by pooling funds so that they have enough to enable a large plant to cover all the funds. Most plants range from 5,000 – 20,000 tree plants to my knowledge. An incredible undertaking to do this on all 4 continents across several countries. The #XRPTree project has enabled OneTreePlanted.org to plant 1,126 to date and across 4 continents. These trees have been calculated to offset 24.77 tonnes of Carbon Dioxide from Ripple technology. Planting trees also helps repair land where it has been over-farmed or are as a result of over-harvesting for firewood and other commercial activities. This week, the organization was due to plant another 200 or so trees in Rwanda. @WanderingWare tweeted about the activities a few hours ago. For now, the system is not perfect. All tips via the XRP Tip Bit are managed through the @WanderingWare twitter handle. It is an imperfect system right now but making progress for them to accept $XRP. I am waiting for One Tree Planted to transfer my previous donations to them and other members of the community to our new community fundraising page. The process has been explained in the following post by @WanderingWare. It also includes a QR code for anyone willing to donate via the XRP Tip Bot App. The fundraising page of the #XRPTree project is up and running. The XRP community is hard at work updating it so that each and every donation can be tracked on the site for transparency. The site clearly explains the XRP Community’s mission of offsetting the carbon footprint of the 54 XRP validators in the network. The community also hopes that with time, the One Tree Planted organization will start accepting XRP donations directly as well as through Coil. What are you thoughts on the #XRPTree project? Please let us know in the comment section below. The post How The XRP Tree Project Is Reducing the Environmental Impact of Ripple Technology appeared first on Ethereum World News.